Yardoption was established as a way for traders to purchase CFD on a fabulous platform that’s simple to use. It is our goal to make the trading process as rewarding and simple as possible. Bring CFD/Forex Trading To The Masses. We are always aware of the latest technological innovations thus we provide a modern platform with advanced tool ware, which at the same time is very intelligible and easy to handle, even for traders with little experience. Our traders’ learning progress is essential for us, that is why numerous webinars and other useful materials are always available in our rich e-library. We are ready to give support and professional help twenty-four hours straight and that is the key feature for success of traders and our prosperity. Another one is safety of our platform so, we place much importance on abiding regulations thus making it properly secure. Further on, you get email with your login and password. Use them to log in into the system. Verification is not mandatory. E-wallets: Skrill, Neteller, Yandex.Money, Perfect Money, Qiwi, InterKassa. Bank wire — min $1000. Platform deposit — $250. Withdrawal request are processed after verification. Minimum withdrawal amount — $10. Withdrawal request is processed within 5 working days. There is no need to download an app, trading is done directly from the platform. Unique ability of the platform – option constructor. Trader can combine any types of assets he is interested in and trade on them. For example, trader can pick pair USD with XUA or combine Bitcoin with EUR and ect. Assets are divided into categories and can be added to favorites. All main timeframes: from 1 minute to 1 month. stop-loss and take-profit set based on value or quotation – set the maximum loss or income immediately in dollars without the need to calculate the value of the item. Online-chat. Managers work 24\7, in case there is no one available, platform offers customers to use other ways to contact tech-support. If manager is not available, customer needs to fill out the form where he puts his contact information and manager gets in touch with the customers as soon as he is available. 40 currency bonds — all of the popular ones + plus couple of exotic bonds. 3 commodities: oil, gold and silver. 18 types of stocks: Apple, Amazon, Facebook, ect. Webinars are only available to registered users. Also, our experts give their customers private lessons. Financial calendar from TradingVeiw and every day analysis. Expiration date from 1 minute to 12 month. 3 types of options: Call\Put, Touch\No touch, Inside\outside range. 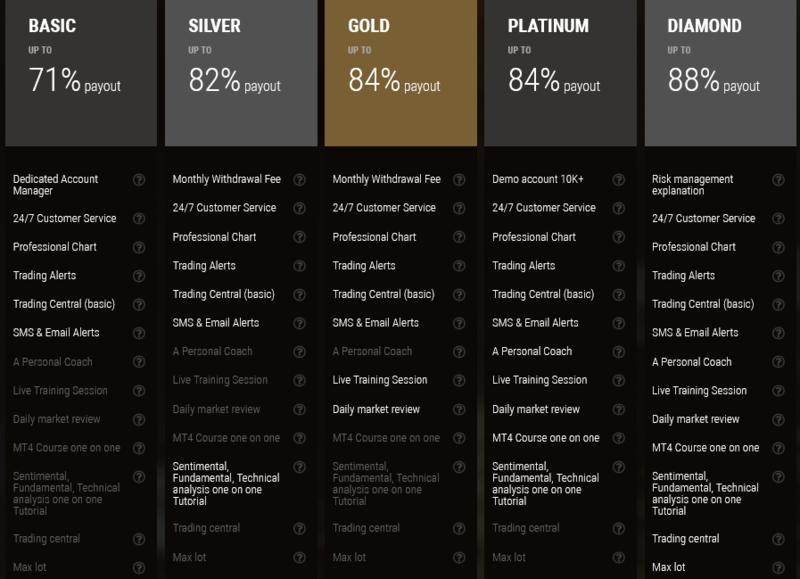 High max profit: up to 100% on Touch, up 200% Range, 71–88% on standard contracts.